Bendell, Beverley. "Alpine Club of Canada". The Canadian Encyclopedia, 12 July 2016, Historica Canada. https://www.thecanadianencyclopedia.ca/en/article/alpine-club-of-canada. Accessed 25 April 2019. Its Canadian Alpine Journal has been published annually since 1907; The Gazette, begun in 1921 as a less formal publication, was replaced in 1986 with a quarterly newsletter. A reference library is maintained in Banff's Whyte Museum of the Canadian Rockies. 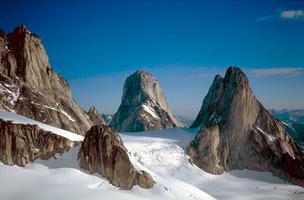 The Bugaboos required expert mountaineering skills for mastery in the time of Conrad Kain (Corel Professional Photos). Alpine Club of Canada, national, nonprofit, nongovernmental mountaineering organization founded in 1906 in Winnipeg, Manitoba. The first president was A.O. Wheeler. The ACC was unlike its British counterpart because it permitted women to become members. Now governed by a board of directors with a permanent office in Canmore, Alberta, the ACC has expanded across Canada and has 10 000 members. The club's objectives include the encouragement and practice of mountaineering, the exploration of alpine and glacial regions and the preservation of mountain fauna and flora. Activities include summer mountaineering camps and winter backcountry ski camps. Its Canadian Alpine Journal has been published annually since 1907; The Gazette, begun in 1921 as a less formal publication, was replaced in 1986 with a quarterly newsletter. A reference library is maintained in Banff's Whyte Museum of the Canadian Rockies. From 1909 until its destruction in 1973 a clubhouse in Banff served as a centre for mountaineers; a new clubhouse was built in 1980 near Canmore. The ACC has built many huts since 1927, when Fay Hut was constructed in Kootenay National Park. Currently, the club operates 23 backcountry huts and is part-owner (with Hostelling International) of the Canadian Alpine Centre in Lake Louise.